Imagine having your car towed from a perfectly legal parking space. 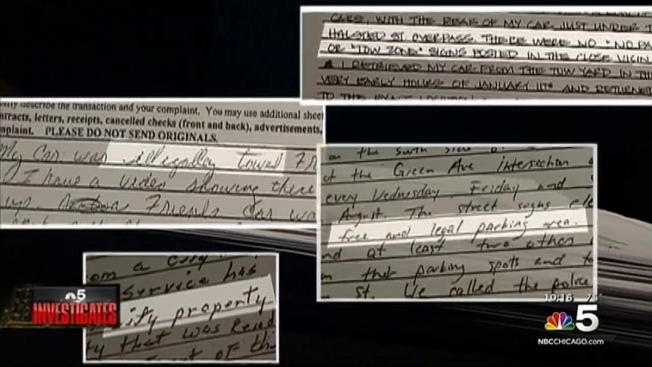 It’s an allegation made by numerous motorists against Chicago towing giant Rendered Services. And NBC5 Investigates has learned that the company is under criminal investigation by Chicago Police, which raided its offices last fall. Bresnahan alleges that Rendered Services actually moved his car from a legal spot, to an illegal space nearby, before towing it away. He says Chicago Police told him they even retrieved footage from a building security camera, which documented the entire episode. A Chicago police source confirmed the investigation, and that computers and various records were seized in the raid on the company’s offices near 36th and Iron. Others in Bresnahan’s building say they observed drivers for Rendered Services moving cars. Later, Scott said he saw the driver retrieve the car and tow it away. Rendered Services does big business in Chicago. Records filed with the state indicate that in 2012, the company towed some 22,000 cars, reporting over $4 million in revenue. But NBC5 Investigates reviewed scores of complaints filed by angry motorists against the company with the Illinois Commerce Commission and the Illinois Attorney General. Many telling remarkably similar stories of having cars yanked out of legitimate parking spaces. Milosz says he eventually convinced the driver to release his car after threatening to call the police. But others have not been quite so persuasive. The company has been cited scores of times by the Illlnois Commerce Commission for allegedly towing cars from areas where they have no jurisdiction. Out of 140 citations written by the ICC police reviewed by NBC5, only 34 were sustained. But the police source confirmed that their investigation of the firm continues. An ICC spokesman said the agency is assisting the Chicago Police Department in their investigation.